Author Maaza Mengiste talks about her novel and the difficulties of writing historical fiction at a Thursday night lecture. Mengiste, who wrote the award-winning novel “Beneath the Lion’s Gaze” about the Ethiopian revolution, is the Center for the Writing Arts’ spring Visiting Writer in Residence. Author Maaza Mengiste spoke about the impetus behind her book, “Beneath the Lion’s Gaze,” and the challenges of writing historical fiction at a Thursday night lecture hosted by the Center for the Writing Arts. The novel by Mengiste, the center’s Visiting Writer in Residence for Spring Quarter, was named one of the 10 best contemporary African books by The Guardian. It takes place during the Ethiopian revolution beginning in 1974, when the Armed Forces Coordinating Committee took over state power, toppling the monarchy of Haile Selassie. Mengiste told an audience of about 15 students and faculty members the story emerged out of a short story she submitted to be workshopped at her creative writing masters program at New York University, where she said she was surprised to be confronted with an audience that knew nothing about the revolution. 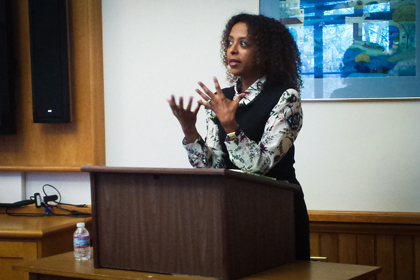 Mengiste’s talk followed a reading of her work on April 15 and a tea with members of residential colleges last week, all events the Visiting Writer in Residence holds each quarter, said Reginald Gibbons, the director of the center. “It’s very useful for undergraduate creative writing students to be able to study for a quarter with someone whose awareness of the novel is international and even may have been raised in a different culture as a writer,” Gibbons told The Daily about his selection of Mengiste for the visiting position. “She remains someone who’s very much binational, and I think that’s a really important perspective. Prof. Sarah Valentine, a creative writing and comparative literature instructor at NU who attended the talk, also said she appreciated Mengiste’s more global point of view. Mengiste also discussed the difficulty of writing stories about conflict and the need for emotional and physical distance from painful events in order to write about them, bringing up recent examples of conflict.